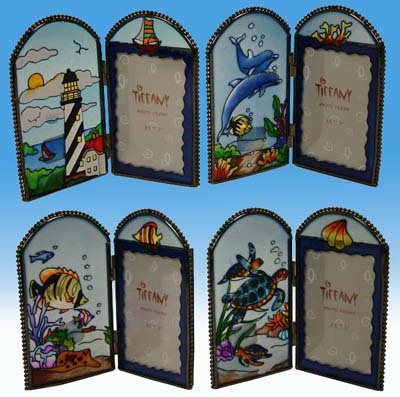 These set of 4 photo frames in four assorted designs include a lighthouse, tropical fish, dolphin and a sea turtles. These exclusive photo frames are made out of stained glass. Each frame is 6.25 inches tall and holds 3.5 x 5 inch photo. Functional pieces of artwork that will bring a lifetime of enjoyment. A wonderful gift for a friend or loved one as well!